Pictured here are a few of the original Pachamama Sisters, that group of brave gals who came on my first trip to Ecuador—the journey that served as the inspiration for Fill the Sky. None of us knew exactly what we were getting into, but all of us were drawn, somehow, down to that sacred place. Inspired by nature, the shamans and each other, that trip set us all down various paths of transition, and bonded us forever. 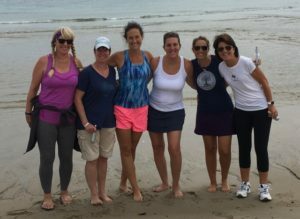 I was so lucky to have had this group come to Cape Cod for a book blessing this past weekend. Each of us wrote out our intentions for the book, placed the messages in a bottle, and set them out to sea. My intention? That this books finds just the right people in the world who will enjoy it, embrace it, and pass it on. Good luck, book!